KANSAS CITY, Kan. — Pam Riordan, the new archdiocesan consultant for children’s catechesis, can empathize with parish catechists and directors of religious education. That’s because Riordan is a 12-year veteran of parish religious education programs herself. But she can also empathize with parents who have children in religious education programs. That’s because Riordan and her husband Jake have two children in the religious education program at their parish, Holy Spirit in Overland Park. Religious education was formerly part of the youth evangelization office and was overseen on a part-time basis. The new office of children’s catechesis is a stand-alone entity within the family & child formation division, with archdiocesan superintendent Kathy O’Hara as division secretary. Given her background, it almost seems fated that Riordan would play a major role of some sort in propagating the Catholic faith. Riordan, a native of Wichita, grew up in a strongly devout Catholic family. Both of her parents were raised Catholic. It was her maternal grandmother, however, who was “the rock of our faith,” she said. Holiday dinners were planned in relation to Mass times. The annual St. Patrick’s Day parade always culminated in Mass — with Riordan and her siblings taking part in the offertory procession in Irish costumes. “I didn’t know until I was older that you didn’t have to pray the rosary on long car trips,” said Riordan. Riordan went to Benedictine College in Atchison for one semester, but from her sophomore year on was at the University of Kansas in Lawrence. “Where are you going?” her dorm-mates would ask. College was a time when Riordan consciously and independently chose to practice her faith. She also chose to become involved in the St. Lawrence Catholic Campus Center, and took every noncredit School of Faith class she could take. Later on, that would prove crucial. Riordan graduated from the University of Kansas with a bachelor of arts degree in education with an emphasis on community health. She got a job as a clerk in a law firm, and began teaching in religious education programs at two parishes. 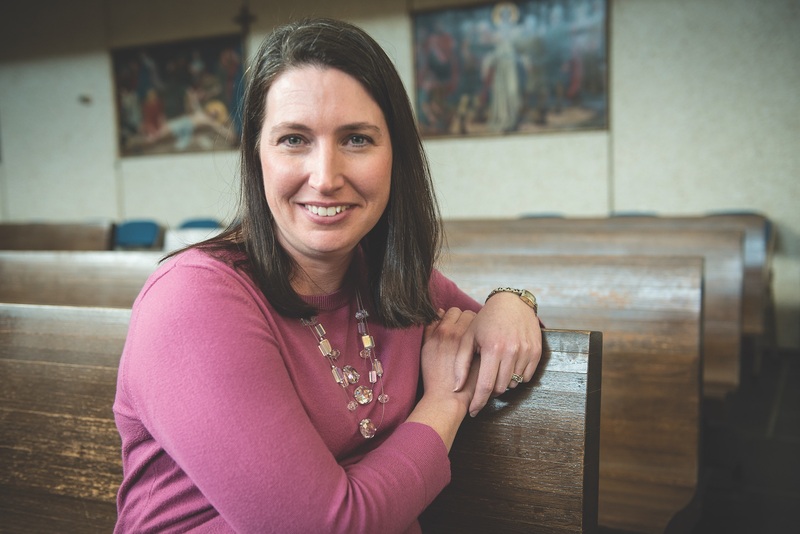 She taught a confirmation class for eighth-grade girls (with the future Father Scott Wallisch) at St. Paul Parish in Olathe, and sixth-grade religious education at St. Michael the Archangel Parish in Leawood. Occasionally, her roommate — the St. Michael’s youth minister — asked her to help with youth group activities. One day, she told Riordan that the parish coordinator of religious education wanted Riordan to send in her resume. But she did it anyway. And was called in for an interview. And they offered her a job — as coordinator of religious education. The formation she received while at the St. Lawrence Catholic Campus Center clinched it. Riordan was only 23 years old. Riordan filled that role at St. Michael the Archangel Parish for almost 10 years. Then, she became director of confirmation classes at St. Paul Parish in Olathe. Her new position she saw advertised in The Leaven. It sounded “so great,” she said. But Riordan wants to get a sense of the “lay of the land.” She wants to listen to parish catechists, pastors and directors of religious education to learn what they want and what they need. Parish religious education programs face many challenges. But there are also a greater variety of resources available now compared to when Riordan started out in the field, thanks to things like the archdiocesan Digital Media Center and the internet. Still, catechist formation is an ongoing challenge. Riordan feels like she’s building on a good foundation and wants to build good relationships. “I hope people will see our office as someone who is there to help,” she said. Woohoo! Way to go Pam!